High Efficiency DC/DC converter ICs. Powerlinker THV3xxx series has the sequence setting function for power supply system. 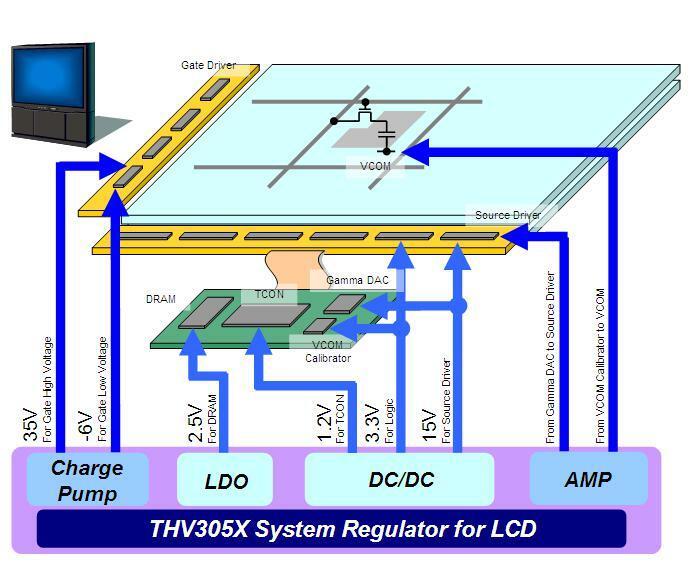 THV series is suitable for power supply system of TFT LCD panel. THV series can be utilized for reduce board space by integrating all necessary function into 1chip. We can provide you with various solutions for large-sized LCD panels and small-and medium-sized panels. The followings are THine's lineups of High Efficiency DC/DC converter ICs. Powerlinker series has the sequence setting function for power supply system. 'Powerlinker' and 'Transphase' is a trademark of THine Electronics, Inc.
As one of THine Electronics developments, We develop and sell LSI dealing with relatively higher voltage.